We’re taking a breather, as expected. Interesting that the pullback occurred right at a trendline (the dashed line below) drawn off the 3/16 and 4/18 lows. We could look at the action since the recent lows as a backtest of that line. Quite often, these backtests (off trendlines established by important pivot points) are the last up move before a substantial drop. If we bounce hard and head back down, we will at least test the Oct ’07 trendline, as noted above, and possibly even the rising wedge at 1316. A likely scenario at that juncture would be an broadening wedge, governed by the dashed trendline above and either the Oct ’07 trendline or rising wedge below. Again, failure to hold the wedge would be disastrous for the bulls. What do we get today? A huge red candle that ranges from the dashed trendline to the rising wedge. Almost like the market gods were listening, or something. What I was watching, but didn’t feel confident enough to share, was a bearish butterfly pattern (5/23-5/31 on hourly). The bottom of it was kinda squirrely, and the entry wasn’t very clean, but I’ll mention them anyway in the future. (1) did we top at 1370 and this is B of an A-B-C correction after the first wave down over the past few weeks? (2) if so, will the Fed come to the rescue? We’ll know tomorrow (or overnight) whether there’s any follow-through potential on the downside. 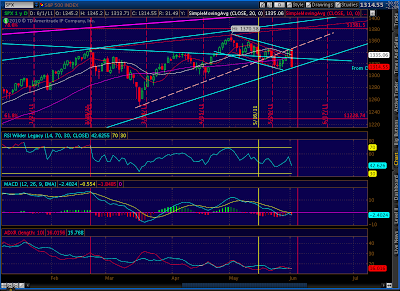 My expectation is that we’ll bounce back as high as the Oct ’07 trendline at 1330. It would make a nice C wave for the next move down. Again, the key is the bottom of the rising wedge — currently around 1311-1312. If we break down below it, we might backtest a few times, but the game is over for the bulls. Our next target would likely be 1295, and after that 1280. 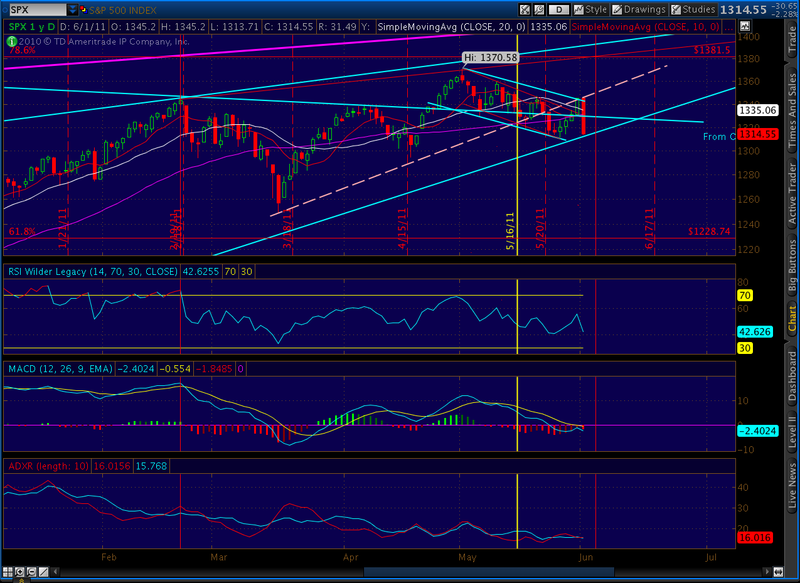 If we rebound past 1330 (and I’m not holding my breath), look for the next major resistance at the channel top at 1342. Any move above here, if it survives backtesting, would target the 1358 level yet again. I don’t see any harmonics that are screaming for a particular direction, but I’ll look more later. Again, I don’t see a lot of value in declaring “bull” or “bear” right here. If the market’s heading down, there will be plenty of downside left in which to score some major profits. Just check the 2007 “top.” LOTS of entry points. Calling a top is good for the ego, but I intend to let the market tell us which way it’s going, then invest accordingly. Re question 2, heck if I know. It’s obvious that another round of QE would just make things worse in the medium and long term. It might even make things worse in the short run, if they run that up the flagpole but no one salutes. Kiss whatever shreds of confidence the market has left good-bye. On the other hand, I can’t imagine they’ve no further tricks up their sleeves. Who among us would be surprised to see additional bogus “announcements” or some other more tangible manipulation now that backs are up against the wall. And, I don’t trust Congress to argue for the greater good here. IMHO, these are desperate times that will likely produce desperate measures. Stay groovy.